With the pervasive nature of social media in consumer culture, consumer awareness is at an all-time high and this means suppliers need to label all products carefully. Sustainability is becoming a key ingredient when putting together a consumer-friendly product so it is vital that the label indicates this clearly. Here are some of the trends emerging in ‘going green’ labels. The more consumers want to know, the more information is needed on the product label. This is prompting more space efficient designs to include ingredient lists or product benefits. Designs such as fold-out labels and the really appealing 360° display are proving popular. In addition to wanting as much product information as possible, people also want to know that the product is certified by some form of authority. 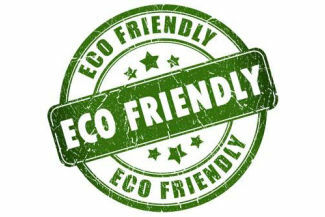 Companies that have the required authorisation can apply an eco-label to indicate the product is approved. Consumers will then know that the product meets stringent criteria and goes through the various checks. As with any design, colour has a major visual impact on the consumer which makes your label colour palette important. It’s been found that natural colour tones are a preferred option with white reflecting simplicity, green eliciting feelings of freshness and blue connected with dependability. Colour psychology is a powerful sales’ tool so considering an all-natural colour scheme is a great idea, but be sure you don’t lose the product in too much neutrality. A pop of colour here and there can make the product stand out. The terminology related to green labels can be a minefield – if used incorrectly. There are strict criteria for green labelling, so be sure to check these terms before going ahead. Organic – free of synthetic materials (antibiotics and pesticides); refrains from using genetically-modified organisms; preserves natural resources and animal standards. Green – a broad term referring to a lower environmental impact that traditional practices; commonly sourced locally; free of renewable resources; often biodegradable. Fair Trade – created using agricultural diversification and erosion control; improve social conditions of workers through wages and treatment. Renewable materials – can be created in a short period using natural processes; sustainably harvested without pesticides; not necessarily recyclable. Natural – no artificial ingredients. Recycled content – made from pre-consumer or post-consumer waste. Biodegradable – the product breaks into carbon dioxide, water and inorganic compounds at a similar rate to paper. Free of – has no, or only trace amounts, of certain ingredients; substitute ingredients cannot be equally as damaging as the replacement. If you’re bringing an environmentally-friendly product to the market, then you’re on the right track, but you need to take it a step further. Work with a reputable label supplier and discuss the eco-friendly label options at your disposal. It’s important that the label perfectly conveys the product message otherwise you will be missing out on a huge market. It is important to partner with a label manufacturer that understands your industry and what is required in green label production. Rebsons Labels is a leading supplier of labels in South Africa and produce self-adhesive labels for local and international clientele from various industries. For the highest quality labels through either digital printing or various other label printing processes contact Rebsons Labels today to discuss your needs.